Lunula is one of the most mysterious signs coming from ancient cultures. People believed that this lunar sign was able to preserve femininity and fertility in young girls. The lunula sign was put on a newborn girl and was burnt on the day of her marriage. Some artifacts show not only the lunula but a female silhouette. This pendant is a replica of an ancient finding and is reproduced with great passion to details and meanings. The lunula plate is ornamented and it repeats the ornament of the finding. You can choose a pendant made of bronze or silver. Each pendant is handmade. 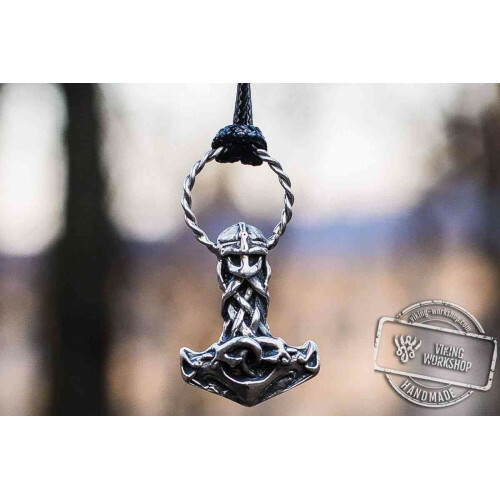 We supply pendants with durable cords (the cord can be different from the photo), however we offer a big choice of stylized Viking chains to securely wear your amulet.